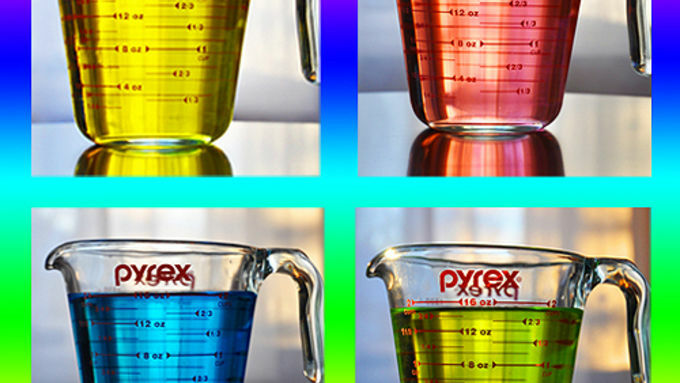 Add food coloring to water in a glass measuring pitcher (or other clear glass container) one drop at a time until you get the color you want. Mix food colors to make custom hues, if desired. 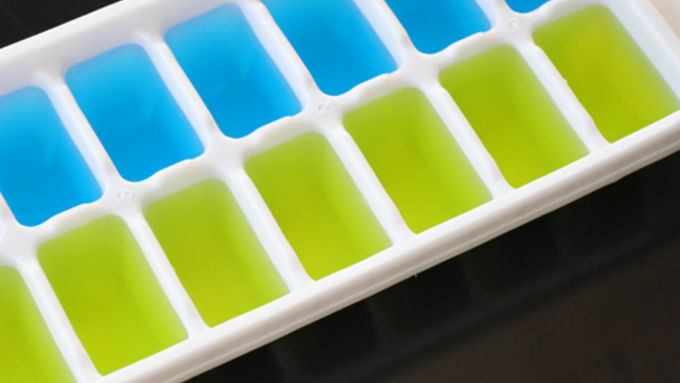 Pour colored water into compartments of an ice cube tray and freeze solid, about 2 hours or more. Place cubes in a chilled glass bowl or ice bucket to add sparkle and color to any party bar. Two cups of water fills one ice cube tray (about 16 cubes). Make more in different colors to fill more trays. 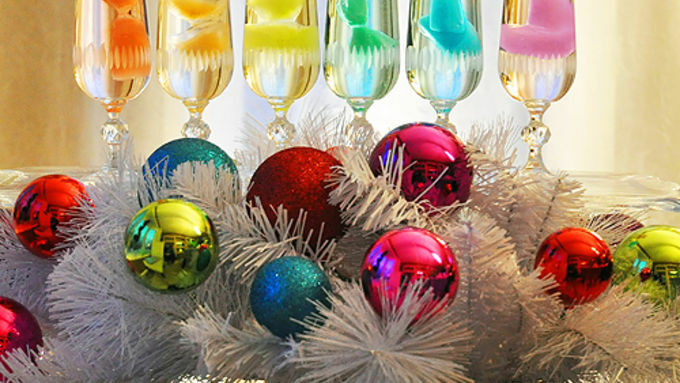 Works best to chill clear beverages such as Sprite, club soda, sparkling grape juice, water or sparkling white wine. Rock your "on the rocks" with rainbow COLORS! The home bar. It might be a bar-height counter-top or just a card table put up for the eve, but it's a kinda necessary consideration for a party. Whether you're serving sassy spirits or sparkling sodas, most home bars are kinda, well, lame. Bottles. Glasses. Ice. Pretty standard stuff. Unless ...you have Rainbow Ice Cubes! Now there's an untapped party op for braggin' rights! This idea opens up a whole world of possibilities. Christmassy red and green. Hanukkah blue. Or maybe you've got a special occasion on the horizon? You can keep track of glasses by cube color -- purple for Kate, lime green for Sandra, and of course you save hot pink for moi -- and you'll always know which drink is whose. But best of all is the big bowl of colorful cubes just waiting for your guests to pluck the colors they want. These are fun served with light-colored beverages like Sprite, club soda, sparkling water, sparkling white grape juice, or even champagne. 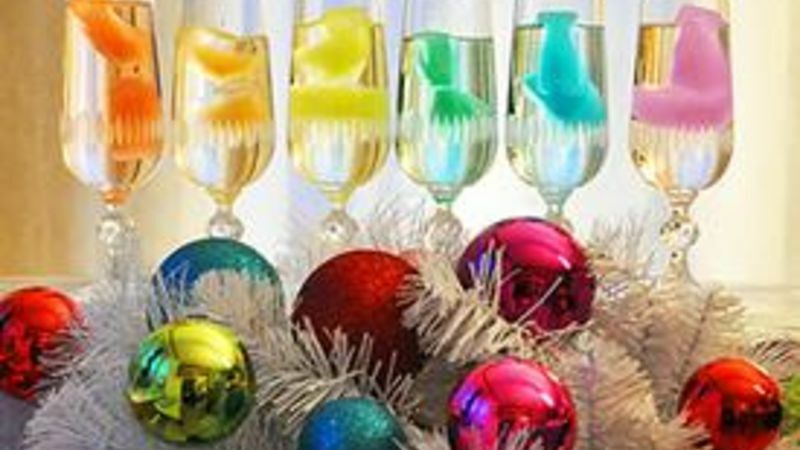 If you're serving kids, they probably won't mind their colors melting together in a muddy mix in their soda, but your adult guests may wish to stick to a single color per glass! You can keep the colors simple or you can get creative by mixing colors, too -- there's a guide on the back of the food coloring box so you can make all kinds of crazy hues to match any special event! Mix your trays, or keep them all one color. It doesn't matter. Is this the most flex party idea, or what? Make a dozen or make a million -- it's just water and food color, so you can go color crazy for practically FREE! Then thank Mother Nature for the inspiration. Go ahead -- make these for your holiday party and have a ball! We know you're as coo-coo for rainbows so we've got a bunch more colorific stuff for you to try this holiday season!